In the price it includes the tasting of local specialties. The place enjoys a great tranquility which is a chance to escape from the hectic life and city chaos. The rooms on the upper floor are equipped with private bathroom and ground floor there is another bathroom with toilet next to the 3rd bedroom. The kitchen is equipped with oven, dishwasher, espresso machine and American, microwave, coffee toast, washing machine and all the comforts. The wellness area on the outside includes the hydromassage Jacuzzi heated with chromotherapy, 5 seats, outdoor solar shower and the gym in front of the house with Finnish sauna and fitness equipment: bench, multifunctional tool, treadmill, exercise bike and back bath hydromassage. In the large park with old trees it is possible to enjoy various areas of relaxation (barbecue area with its table, raised area for lunches and seating area for reading). The place, charming, is. located in the upper Monferrato area, it is surrounded by 4 hectares of vineyards, part of the UNESCO HERITAGE, with an excellent production of Moscato d'Asti and Brachetto d'Acqui (DOCG) and offers the possibility of quiet walks in a splendid countryside. IN THE FIRST WEEKS IN SEPTEMBER, IT IS POSSIBLE TO TAKE PART IN THE HARVEST IN THE VINEYARDS OF PROPERTY WITH EQUIPMENT PROVIDED BY THE OWNER. CASSINE POOLS are only 3 Km away and have two pools, one for adults and one for children, games for children, soccer field, volleyball, table tennis, restaurant video games, bar. The opening is at the end of May. In one bathroom, on the ground floor, there is only the sink and toilet. We spent a week at the Resort La Villa, and we enjoyed every single day there. It is a comfortable house, quite spacious and well furnished. We stayed as a family of three, but on one occasion we manage to accommodate six visitors quite comfortably for one day having a long lunch. The house is set in a tranquil and secluded area with nice views of the surrounding country side and vineyards. We are a family for four ( two boys aged 6, 10 ) and spent the most perfect month in this slice of heaven in the middle of the Piemontese countryside, surrounded by gorgeous Moscato vineyards! The location of the house and the views are really breathtaking and peaceful. We were next to the village of Cassine, 10 mins to the beautiful and buzzing Acqui Terme, and it was very easy to explore the area from Torino, Alba, Asti, to beautiful natural parks bordering Liguria. Milan and the Lakes were also within an hour and a half. The house itself was a home for us. It was spacious enough to house a family of four and also for occasional additional guests (some friends of ours who came to visit us for a few days). The fixtures and fittings were of a very high standard and the hosts go to a lot of trouble to maintain and provide superb services. I especially loved the boutique quality of the linen and towels :) We eat most of our meals outdoors in some wonderful shady and breezy areas in the gardens , considering the heat of the summer, and we were inspired almost daily to experiment, learn and cook some delightful italian local cuisine from scratch!! The jacuzzi was very well used in particular to cool us down. The garden was perfect for our daily badminton, frisbee, yoga etc activities, overlooking the gorgeous green hills. What made our holiday truly special were the warm and wonderful hosts. They went out of their way to make us feel very welcome, bringing us numerous edible treats, wine, cheese, homemade jams during our stay. The highlight for the children was indeed the start of the Wine harvest that they had the excitement and pleasure of taking part in, as well as a ride in the truck that was taking away the first load of grapes. The wine is the most delicious that we now have a real taste for as an apero! la journée (Portofino , 5 terres). Merci à Enrica et son mari pour leur gentillesse ! Nous avons passé un excellent week-end de 3 jours dans cette maison . Tout y est fait pour passer d’agreables Moments entre amis ou en famille. L’accueil des propriétaires a été plus que chaleureux avec cadeaux de bienvenue , indications sur les lieux à visiter ou encore les spécialités locales. Les petites attentions des serviettes de bain ainsi que le linge de maison sur le lit emballés avec soin nous a beaucoup plu... je souligne tout particulièrement la propreté du lieux qui sent bon et ceci est très agréable. Le jardin est magnifique avec différents endroits pour se reposer. Le jacuzzi au coucher de soleil était juste la cerise sur le gâteau. Merci encore et nous nous sommes promis d’y revenir très vite! A lovely villa in a very quiet and relaxing location. It is nicely furnished, with everything we needed during our stay and the spacious garden was ideal for our young boys to play in. The hot tub was also very pleasant! Enrica was an excellent host – always happy to help and she provided some wonderful homemade food. She was quick to respond to any questions we had, both before and during our stay. We definitely recommend this villa and the local area. Thank you very much for the nice review.Iwas very happy to have you as our guests. It is a pleasure to share our house with guests loving every details.I hope to host you again. 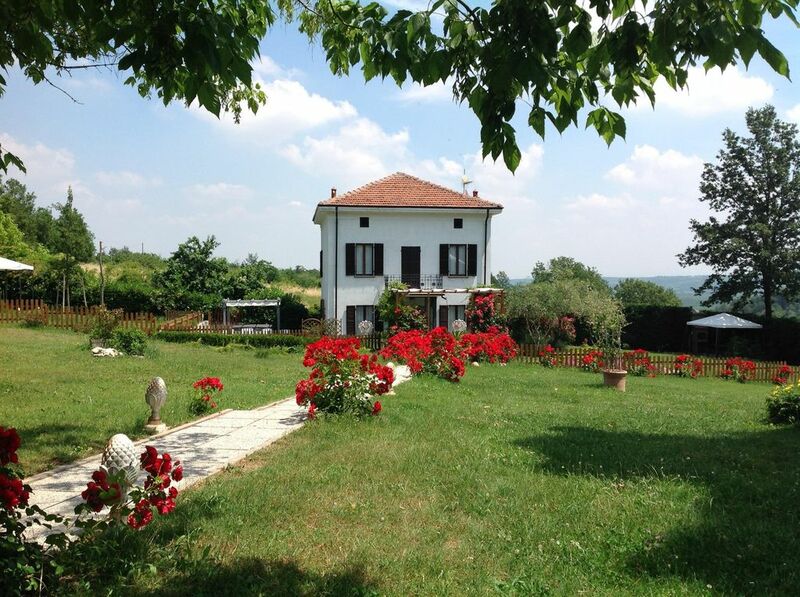 The location is located in the Monferrato area of ​​the UNESCO heritage. Just 3 km away is a very large communal pool with games for children and adolescents. In the town of Acqui Terme (just 8 km) from Roman times you can enjoy additional wellness paths and waters rich with minerals. For lovers of good food will be provided land by the owner a list of local restaurants. For lovers of the 'do nothing' place in itself offers the opportunity to enjoy a view of the vineyards and positions of absolute relaxation. The outlet of Serravalle, which is only 30 minutes away, offers the most famous Italian and the opportunity to buy at a reasonable price Heads of haute couture. The cellars are located in the village produce fine wines and it will be the owner personally accompany guests by winemakers to taste their specialties. Le pulizie al termine del soggiorno non sono comprese ma hanno un costo di 60 euro.